Cannabis is a plant that enjoys mild climates. It thrives in sunny, warm climates and responds negatively to temperatures that dip too low. This can pose challenges for those who grow marijuana year-round and want to produce a significant winter crop, and may call for a little extra heating. Outdoor cultivators experience the biggest obstacles when it comes to growing cold-weather cannabis since crops are exposed to the harsh winter climate. In the United States’ temperate climate, only the warmest regions can attempt an outdoor grow during the short, cold days of winter. Even cultivators in the warmest temperate regions must choose their strains and overall operations plan wisely. Even a greenhouse grower will experience unique challenges relating to reduced photoperiod and heating reductions during the winter. Indoor growers have the luxury of seamless production year-round, because their controlled indoor climate never varies regardless of the calendar date. The home grower and indoor commercial cultivator may pay more for heating and electricity during the winter, but their operations will continue without so much as a hiccup when it comes to ideal climate conditions and overall plant health. Let’s examine the various strategies that cultivators can employ in a variety of growing environments. Each poses its own challenges and solutions. Cannabis has a fairly rigid needs when it comes to growing temperatures. Humidity is also a factor, but mainly in environments where outdoor ambient humidity is too high. The temperatures in which cannabis grows the best vary slightly during various stages of growth, but the differences aren’t too extreme. Marijuana plants do not respond well to temperatures that either too warm or too cold. Throughout most of their lives, the plants will do very well in the 70- to 85-degree (Fahrenheit) range. Temperatures that fall below 60 degrees or rise above 95 degrees will stress the plants and cause them to grow slower—or at least less than an optimum growth rate. Temperatures that dip to the freezing level can kill a healthy cannabis plant. Conversely, heating that rises above 95 degrees will result in stressed plants that grow slower and have drooping or cupped leaves. Plants grown in temperatures that are too low or high are more susceptible to various diseases and pests that commonly impact cannabis, especially in environments with overly high humidity. Ailments such as white powdery mildew, spider mites, mold, and root rot are more likely to occur under these extreme conditions. Prudent cannabis cultivators will prevent large temperature fluctuations. They should also be mindful of the perfect temperature during the various stages of the plants’ development. Each stage of plant growth has ideal conditions that will allow the plant to reach its full potential. The risks associated with improper temperatures either indoors or out are by no means limited to those mentioned above. Cold-weather cannabis has the potential can have serious drawbacks if low temperatures go unchecked. At temperatures of 55 degrees or lower, trichome development ceases and overall potency diminishes. Since high potency is the desired result of every grower, overly cool temperatures can result in a very undesirable situation. During the seedling (or small clone) stage of growth, young cannabis plants enjoy an ideal temperature range of 68-77 degrees (Fahrenheit). At this early age when their root systems are still developing, seedlings will also appreciate a slightly higher humidity than at any other stage of their growth. Humidity of 65-70 percent is just about right. During the later stages of vegetative growth, the ideal temperature range rises a bit to 71-82 degrees Fahrenheit, and humidity requirements will decrease approximately 5 percent per week and fall into the 40-65 percent range. In the flower stage of growth, the ideal temperature will fall to 70-78 degrees (Fahrenheit). These temperature fluctuations simulate what a cannabis plant growing outside will experience during the spring, summer, and fall months. Since outdoor grows aren’t practical in most of the U.S. because of low temperatures and shorter day length, a good option for keeping plants warm during the winter is to utilize a greenhouse, which, by nature of its design, captures solar energy and retains the heat produced by sunlight. Unless the greenhouse grow utilizes HID lights (high-pressure sodium or metal halide) to extend daylight beyond short winter days, the plants contained within will most likely be auto-flowering indica-dominant strains that flower automatically and mature quickly. If HIDs are in place to extend daylight hours during the nighttime, the warmth generated by the lights will supplement the natural warmth the greenhouse retains. The most logical and potentially productive cultivation site during the winter will be indoors. The protected and sealed environment indoor grows provide allows cannabis cultivators to dial in on the exact needs of the crops at all stages of growth. The temperature issues with most indoor grows usually relate to temperatures that are too high. The HID lights emit quite a bit of heat, which is why grow tents have built-in ventilation and exhaust ports to lower temperature level so they don’t get high enough to adversely effect the plant. A small grow room or cabinet that lacks the means to remove heat and provide air exchange can easily result in temperatures that exceed 120 degrees Fahrenheit—which is very bad for cannabis. Since most indoor grows have ambient temperature controls and thermostats, they retain adequate heat, even during the evening hours. If a home grow room occupies an outdoor building without supplemental heat, a wise practice is to keep the room completely sealed from any light leakage and adjust the HID lights to go on at night and off in the morning, taking advantage of the HID heat when it’s most needed. Since home growers will often tend to their plants at night anyway, this lighting schedule is quite advantageous. While HID lights and their related heat production during hot summers can be a liability, they can become an asset to growers during the cold winter months. Utilizing the warmth they provide will reduce or even eliminate the need for supplemental heat. 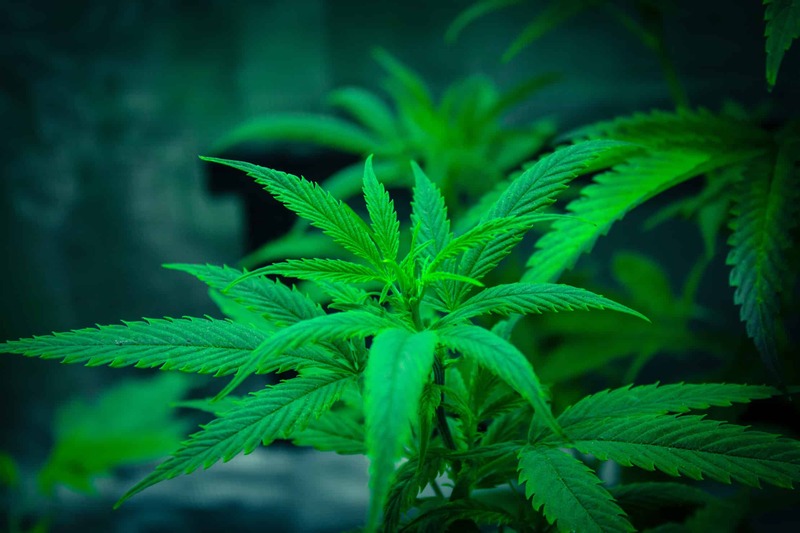 The use of light-emitting diode (LED) lights is rapidly gaining in popularity and becoming all the rage in cannabis grows because of their efficiency and lower operating costs compared to HID lights. Although they may be more expensive to purchase initially, their operating costs are lower than HID. The dilemma with LED lights during the winter months is that they do not produce the heat that can be so advantageous during that time of year, with proper planning. In grows with ambient heat control for the whole building, the lack of LED heat is inconsequential. Since both LED and HID lights are in wide use in today’s cannabis space, their use is dictated by the preference and discretion of the cultivator. At this stage of the industry’s development, each has a use and purpose. Providing both adequate photoperiods and heating during the frosty winter months can pose challenges for cannabis growers, but there are ways around these issues to allow year-round flower production. Although winter harvests will sometimes have lower yields than those grown during other months depending on cultivation strategy and operations, warm winter growing is not that difficult and can yield a bountiful crop.